Jeroen Minnema at Ocean Independence calls to say that the price of his central listing, the 26.02 motor yacht Valeria has been reduced by a significant €550,000. Valeria is a Riva 85 Opera built by Riva in 2004 to RINA class and MCA compliant. 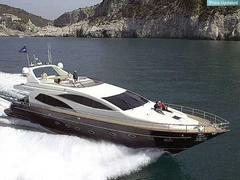 Her elegant, understated interior sleeps eight guests in a master, VIP and two twins and her twin MTU engines give her a cruising speed of 25 knots with a maximum speed of 33 knots. Currently the only commercially registered Riva 85 Opera on the market, Valeria is now asking €2.95 million.